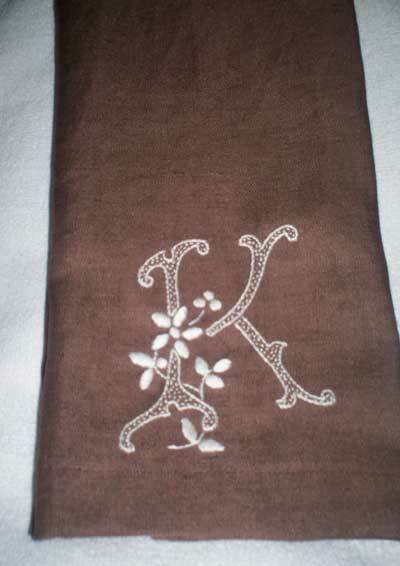 Reader’s Embroidery: Monogrammed Guest Towel! I’m glad to see that some readers are having fun embroidering some of the monograms from the alphabet I’ve been posting recently! 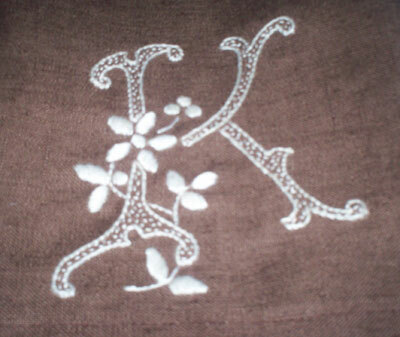 Meeta sent photos of her recent hand embroidery project – a guest towel made from dark brown linen, with the “K” on it worked in white…. Meeta used a nice combination of embroidery stitches – seed stitch for the filling on the K, stem stitch around the outside, and the flowers are satin stitched. I really like the effect of the embroidery in white on the darker fabric! I find it very striking! I like it!!! Thanks for sending along the photos, Meeta! Congratulations on a job well done! Thank you so much to both Mary & Jeannine.